Alumni in Class of 1925 H.S. 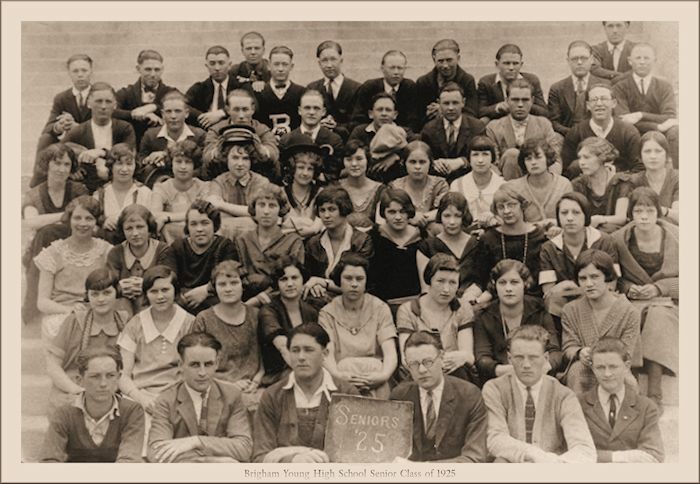 Brigham Young High School Class of 1925. Class of 1925. Erma Bennet. She received a BYH Normal Diploma in 1925. Source: Annual Record, B.Y. University, Book 10, page 398. ~ ~ ~ ~ Collegiate Grad of BYU, Class of 1934. Erma Bennet. She received a BS Degree in Elementary Education in 1934. Source: Annual Record, B.Y. University, Book 10, page 398. Class of 1925. Pauline Bennett. Source: 1925 BYU Banyan yearbook, BYH section. Class of 1925. Melba Blackburn, of Delta, Utah. She graduated from Brigham Young High School in 1925. Source: Class Roll in the program of Closing Exercises of the Senior High School Class, Brigham Young University, 1925. Her photo appears in the Fourth Year composite photograph of the Class of 1924, when she was a Third Year. Background sources: BYU/BYH Annual Catalogues for the School Years 1923-24, 1924-25, and 1925-26. Class of 1925. Leona Booth [White]. She received a BYH Normal Diploma in 1925. Source: Annual Record, B.Y. University, Book 10, page 474. ~ ~ ~ ~ Leona Booth was born on October 25, 1905 in Provo, Utah. Her parents were Aldred Lewis Booth and May Ashworth Booth. Leona married Lowell Franklin White on November 26, 1937 in Manti, Utah. Leona Booth White died on January 30, 1998. Class of 1925. Newell Bown. Newell Bown was a 4th Year (senior) in the Class of 1925. His photograph appears in the 1926 BYU Banyan yearbook, BYH section, but it is likely that he had already graduated from BYH in 1925. Background sources: BYU/BYH Annual Catalogues for the School Years 1923-24, 1924-25, and 1925-26. ~ ~ ~ ~ Collegiate Grad of BYU, Class of 1930. Newell Wayne Bown. He received a BS Degree in Accounting & Business in 1930. Source: Annual Record, B.Y. University, Book 10, page 474. ~ ~ ~ ~ Newell Wayne Bown was born on May 11, 1907 in Provo, Utah. His parents were Joseph Leo Bown and Emma Newell. He married Jennie Winona Brimhall on February 14 (Valentine's Day), 1931, in New York City, New York. She was born on November 14, 1907 in Raymond, Alberta, Canada. Her parents were Mark Henry Brimhall and Guinevere Ricks Smellie. She died on February 8, 1976, in Provo, Utah. Her interment, Provo, Utah. He died on June 24, 1966 in Philadelphia, Pennsylvania. Interment, Provo Cemetery, Utah. Class of 1925. Ovila Bown. Source 1: 1925 BYU Banyan yearbook, BYH section. ~ ~ ~ ~ Class of 1925. Ovila Bown. She graduated from Brigham Young High School in 1925. Source 2: Class Roll in the program of Closing Exercises of the Senior High School Class, Brigham Young University, 1925. At Commencement she sang a duet with Lillian Gardner. Class of 1925. Oscar Brooksby. Source: 1925 BYU Banyan yearbook, BYH section. Class of 1925. Joseph Brown. He served as Senior Class President in 1925. Source: 1925 BYU Banyan yearbook, BYH section. Class of 1925. Birdie Buchanan, of Provo, Utah. She graduated from Brigham Young High School in 1925. Source: Class Roll in the program of Closing Exercises of the Senior High School Class, Brigham Young University, 1925. ~ ~ ~ ~ She was a 3rd Year (junior) in 1924, and a 4th Year (senior) in the BYH Class of 1925. Background sources: BYU/BYH Annual Catalogues for the School Years 1923-24, 1924-25, and 1925-26. Class of 1925. Helen Burns. Source: 1925 BYU Banyan yearbook, BYH section. Class of 1925. Leslie Bush. He graduated from Brigham Young High School in 1925. Source: Class Roll in the program of Closing Exercises of the Senior High School Class, Brigham Young University, 1925. He delivered the Address of Welcome at Commencement. ~ ~ ~ ~ Leslie Edward Bush was born on September 14, 1906 in Pleasant Grove, Utah. His parents were Joseph Edward Bush and Rachel Harriet Easler Bush. L. E. Bush married Lula Clark. Leslie Edward Bush died on February 9, 1969 in Salt Lake City, Utah. Interment, Pleasant Grove, Utah. Classes of 1916 and 1925. Class of 1916. Bessie Call. She received a BYH Normal Certificate in 1916. Source: Annual Record, B.Y. University, Book 9, page 140. ~ ~ ~ ~ Class of 1925. Bessie Call. She received a BYH Normal Diploma. Source: Annual Record, B.Y. University, Book 9, page 140. Class of 1925. Wendell Candland, of Provo, Utah. He graduated from Brigham Young High School in 1925. Source: Class Roll in the program of Closing Exercises of the Senior High School Class, Brigham Young University, 1925. Background sources: BYU/BYH Annual Catalogues for the School Years 1923-24, 1924-25, and 1925-26. ~ ~ ~ ~ Collegiate Grad of BYU, Class of 1929. Wendell H. Candland. He received a BS Degree in Chemistry in 1929. Source: Annual Record, B.Y. University, Book 10, page 474. Class of 1925. Dilworth W. Chamberlain, of Kanab, Utah. He graduated from Brigham Young High School in 1925. His photo appears in the Fourth Year composite photograph of the Class of 1924, when he was a Third Year. Background sources: BYU/BYH Annual Catalogues for the School Years 1923-24, 1924-25, and 1925-26. BYH Class of 1925. DaCosta Clark, of Provo, Utah. He was a 3rd Year (junior) in 1924, and a 4th Year (senior) graduate in the BYH Class of 1925. Background sources: BYU/BYH Annual Catalogues for the School Years 1923-24, 1924-25, and 1925-26. Class of 1925. Ruth Clark. She served as Vice President of the Senior Class in 1925. Source: 1925 BYU Banyan yearbook, BYH section. ~ ~ ~ ~ Class of 1925. Ruth Clark. She graduated from Brigham Young High School in 1925. Source: Class Roll in the program of Closing Exercises of the Senior High School Class, Brigham Young University, 1925. She delivered a reading at Commencement: "Pauline Pavlovia". ~ ~ ~ ~ Collegiate Grad of BYU, Class of 1929. Ruth Clark. She received an A.B. Degree in Dramatic Arts in 1929. Source: Annual Record, B.Y. University, Book 10, page 488. ~ ~ ~ ~ Ruth Ratcliffe Clark was born on October 22, 1903 in Grantsville, Tooele County, Utah. Her parents were Edwin Marcellus Clark and Matilda Curtis Ratcliffe Clark. She married Vaughan Elkington on June 9, 1926 in Salt Lake City, Utah. Ruth Clark Elkington died on May 4, 1976, in Tooele, Utah. Her interment, Tooele City Cemetery, Utah. Class of 1925. Gordan Crandall. Gordan graduated from Brigham Young High School in 1925. Source: Class Roll in the program of Closing Exercises of the Senior High School Class, Brigham Young University, 1925. He offered the opening prayer at Commencement. Class of 1925. Carl Crawford. Source: 1925 BYU Banyan yearbook, BYH section.